PRSO is a hardworking, enthusiastic, committed group of parents who work to ensure that our children’s education is enhanced by field trips, model seders, holiday celebrations, Shabbat dinners, family education programs and special events. In addition, the fundraising done by PRSO provides the school with technology, equipment and resources that we would otherwise need to do without. The success of our religious school is dependent upon this help and the spirit of partnership between school and parents. The School Board consists of Jewish members of the Congregation and is charged with considering and recommending to the Board, for its approval, policies concerning the organization and operation of the religious school, and to make all rules and regulations necessary for the operation of the religious school and, in conjunction with the Rabbi and Education Director, to administer the operation of the religious school. The School Board meets once per month on the first Thursday of the month at 7:30 PM. The School Board also oversees the activities of the Powell Religious School Organization, which supports, through volunteerism, the activities of the Powell Religious School. The School Board appoints a representative to the Room Parents who volunteer for PRSO. This representative is Karen Goodman. The School Board committee is an active committee and is made up of Congregants who are concerned for the well being of the children in the school as well as their Jewish Education. Members of the School Board have children which represent each division of the school, from Sunday School, Hebrew School, and Bar/Bat Mitzvah and Confirmation. School Board members are encouraged to talk with other congregants about the religious school, to bring constructive feedback to the committee. Each year the School Board reviews the School Curriculum, Bar/Bat Mitzvah and Confirmation program, school policies, and issues raised by parents and teachers. As an example of some of the policies instituted in the past two years, we have reviewed and revised the security policies, instituted a cell phone policy, and for the first time last year, created a policy which requires the Confirmands to wear robes at Confirmation ceremonies. School Board meetings consist of a review of the previous month’s minutes, a Torah study presented by Sharon Forman-Toll, a School report, Rabbi’s report, Treasurer’s report and School Board Chair report. Each meeting follows an agenda and new business is added each week. 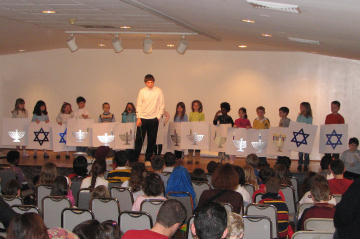 Some of the activities of the School Board include PRSO activities, such as planning for holiday events, organizing Class Shabbat Dinners as part of PRSO, coordinating fund raising activities of PRSO and determining proper placement of the funds which we accumulate (for example, in a previous year the Barton’s candy sale allowed us to purchase new school tables for the classrooms). In conjunction with PRSO, the school board participates in the Fall Book Fair and the Spring Barnes and Noble fundraiser. I would like to personally thank the School Board members, parent room volunteers and all our parents and congregants who support the school by volunteering their time and contributing to our fundraisers.